The villa is made up of a manor house of the eighteenth century and a depandance. The manor house is spread over three floors and consists of: 6 double bedrooms, 6 bathrooms (2 with bath and 3 with shower), a large kitchen, dining room and 6 stays. The dépendance develops completely on the ground floor and consists of: a living room with kitchen area, 2 bedrooms (one double and one with single beds), 2 bathrooms, one with shower and washing machine. The outbuilding is easily accessible even for guests with motor disabilities, in fact there are no differences in height between the interior and the garden, the pool area and the parking lot; the internal spaces are also compatible with the movement of a wheelchair for the disabled (for details of the measures see the map in the photo section). In total, the structure can therefore accommodate up to 16 guests, with the possibility of 2 additional beds (in a room on the ground floor of the main house) and a baby bed. Outside there is also a fully equipped kitchen, a barbecue and a gazebo with a large table. 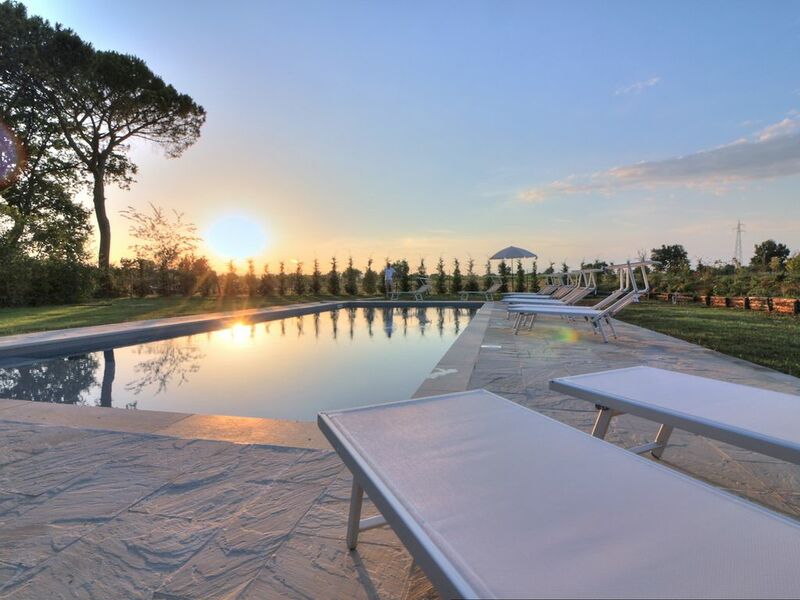 The private swimming pool (open from 1 April to 31 October) is for the exclusive use of guests and is surrounded by a garden of about 2000 sqm completely fenced. The house is immersed in a lush garden of about 6,000 square meters. Part of the property is also a small church. In restoring the structure we have tried to keep the distinctive character of the architectural typology unaltered, based on the use of local building materials: stone, terracotta, timber; these same materials have also been used for new buildings such as the swimming pool and the gazebo. The plant part has been completely renovated in the bathrooms, in the kitchens, in both internal and external lighting; Furthermore, there is a satellite TV system and a wi fi line in all indoor areas, in the garden and in the swimming pool area. Also in furnishings we have maintained all the old family furniture, integrating it with modern elements; in this way it was intended to enhance the beauty of the objects of the past and, at the same time, create conditions of comfort and functionality through the use of contemporary design elements. Our friend and collaborator Franco is involved in the maintenance of the house, the garden and the swimming pool throughout the year; in the periods when the house is occupied by guests, it carries out work on garden care and pool cleaning in the early hours of the morning (6 am to 8 pm), so as to respect the privacy of those who stay for the rest of the day. A final mention of the location of the house compared to major centers of interest: Arezzo (15 km), Cortona (21 km), Florence (80 km), Siena (61 km), Perugia (72 km), Rome (206 km); moreover the location is suitable for a good choice of cycling routes. 20 minutes away are the Equestrian Center and the Valdichiana Outlet Village. The A1 motorway is around 15 minutes by car and the nearest train station is 10 minutes (Castiglion Fiorentino). A cash deposit is required at check-in, which will be returned without any damage upon check-out. Bellissima villa immersa nel verde. Un capodanno da favola con amici e parenti, in un'atmosfera di altri tempi. Nonostante la villa fosse molto grande, le stanze ed i bagni erano caldi a dovere. Il cuore della villa è senz'altro la cucina, grandissima con un camino che prende quasi tutta una parete. lì abbiamo passato la maggior parte del tempo. Credo che d'estate sia favoloso passare dei giorni di vacanza in questa villa meravigliosa. Un ringraziamento particolare va al proprietario della villa: Gheraro Bittoni. Molto gentile e disponibile. Grazie a lei, Alessandro, e alla sua famiglia, per l'apprezzamento e il rispetto che avete mostrato verso la casa. Siete un gruppo cui fa sicuramente piacere affidare la propria casa!